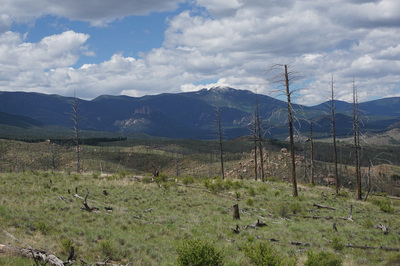 Directions: From Denver head west on I-70, east on C-470, and south on Hwy 285 to Pine Junction. Turn left (south) and follow 126 south through Pine and Buffalo Creek. 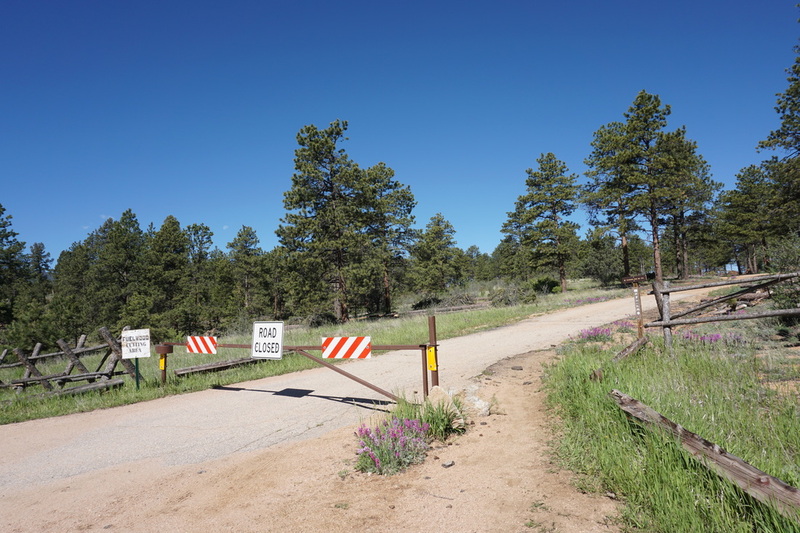 Look for signs for the Colorado Trail crossing and park on the west side of 126 just next to the gate closing off the dirt side road. The parking area is just south of the turn off for the Long Scraggy Peak Ranch. 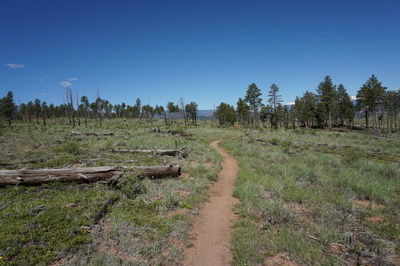 The Nice Kitty Trail was completed in 2012 and is one of the newer trails in the Buffalo Creek Recreation Area, new enough that it does not show up on every map of the area. 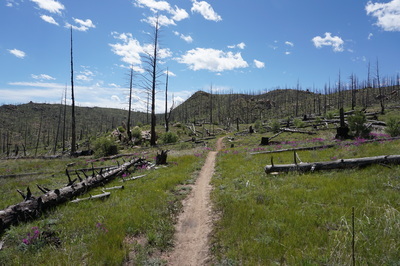 Therefore, when I mistakenly turned onto this trail from the Buffalo Burn Trail, it took me 3 miles to realize that I was not where I was supposed to be. 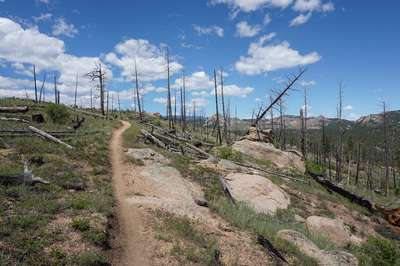 A wonderful mistake as this trail is simply stunning. 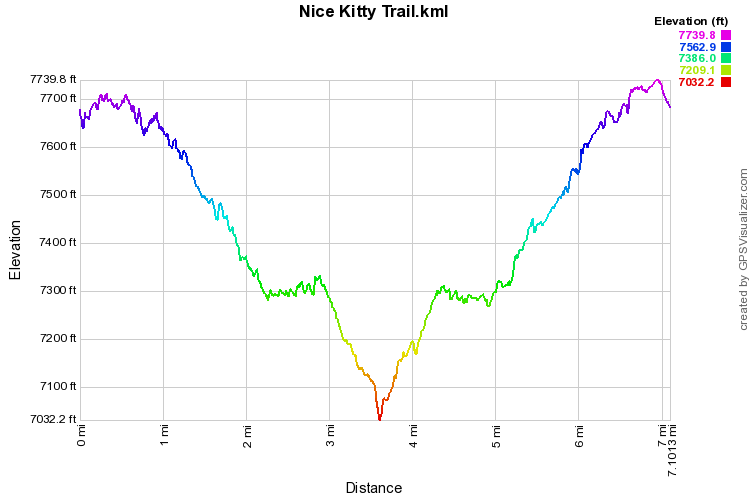 The Nice Kitty Trail, like most in the Buffalo Creek Rec. 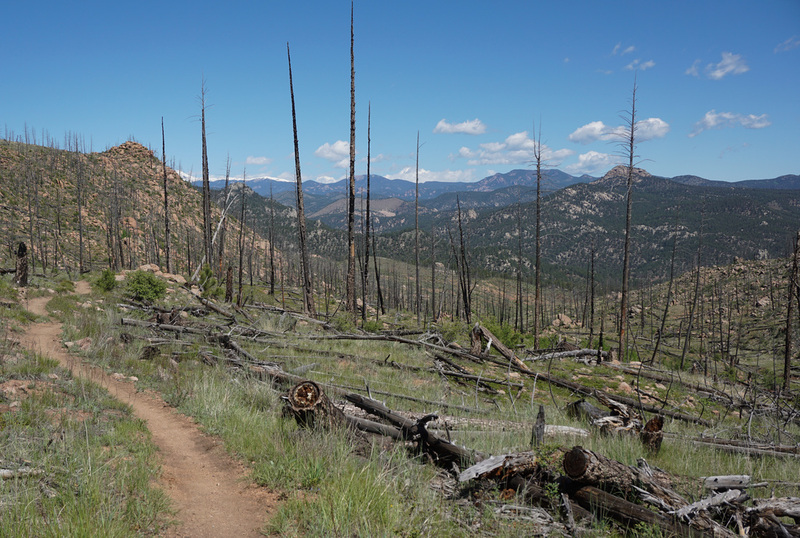 Area, is really meant for mountain biking so you might feel a bit like a fish out of water. That being said, every biker I met along the way was friendly and courteous and thrilled to be out on such an amazing trail. While these trails are meant for biking, they really are fantastic hiking trails as well. 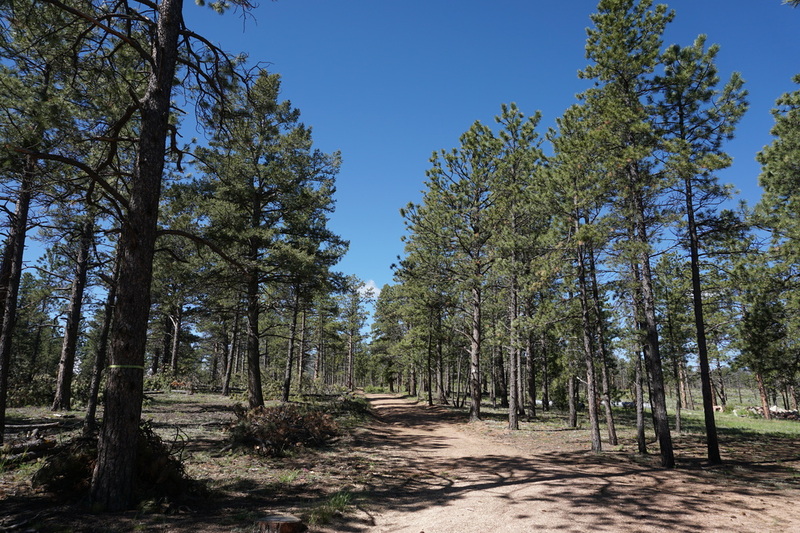 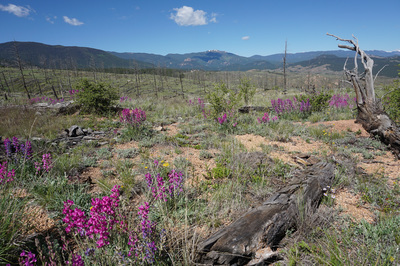 The real trailhead is located on S. Buffalo Creek Road but this hike description starts from the Colorado Trail Trailhead along 126, just across the road from the trailhead as for the nearby Chair Rocks hike. 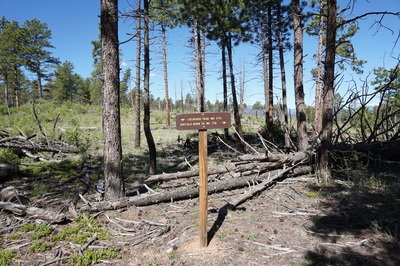 From the road, head west along the Colorado Trail for a few minutes until you see the sign for the Buffalo Burn Trail, turn right. 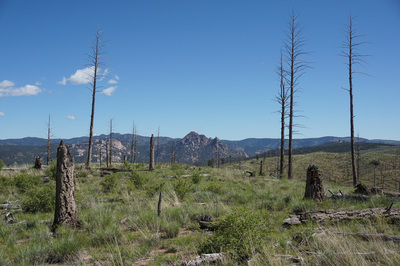 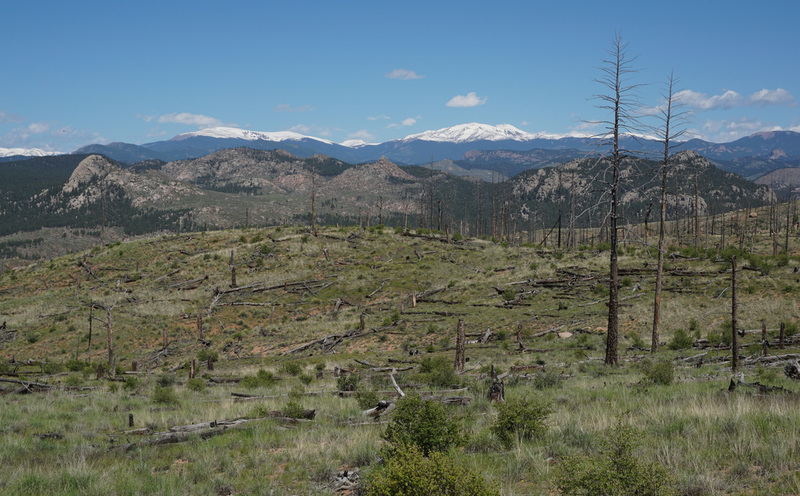 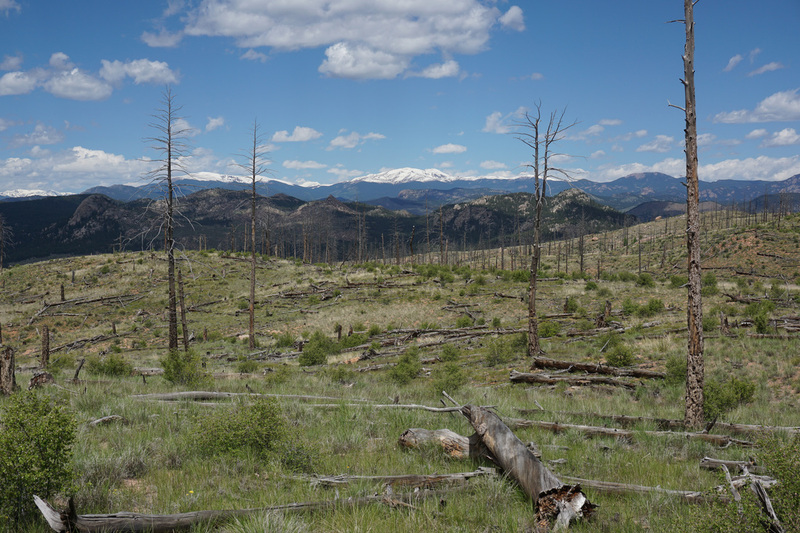 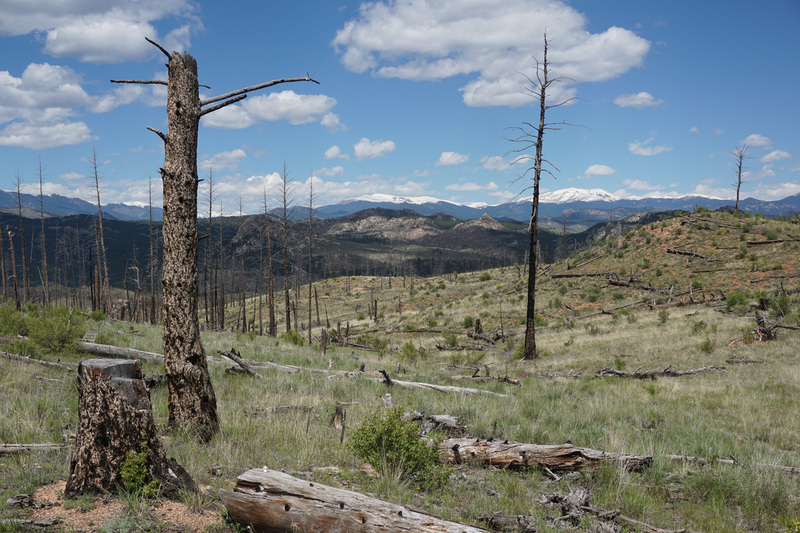 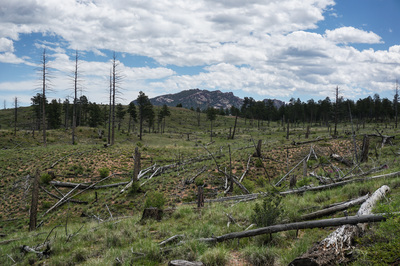 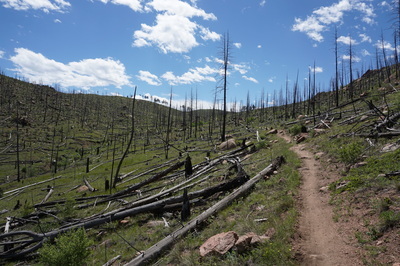 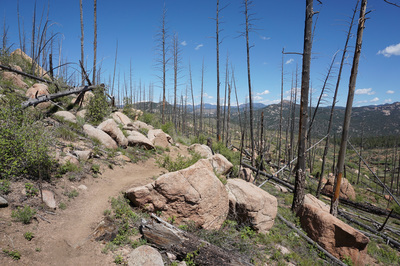 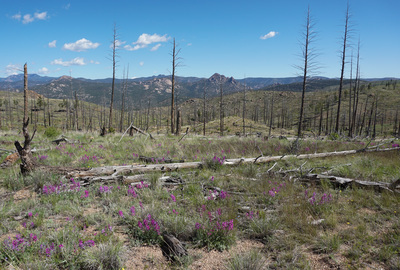 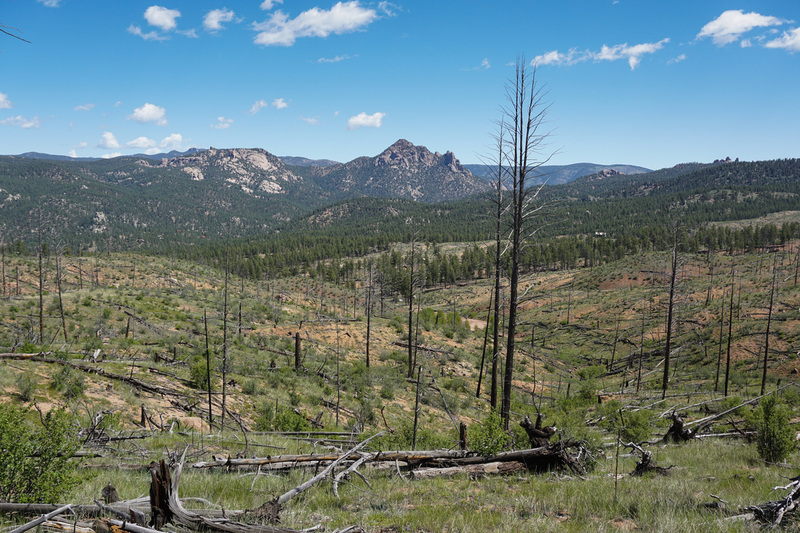 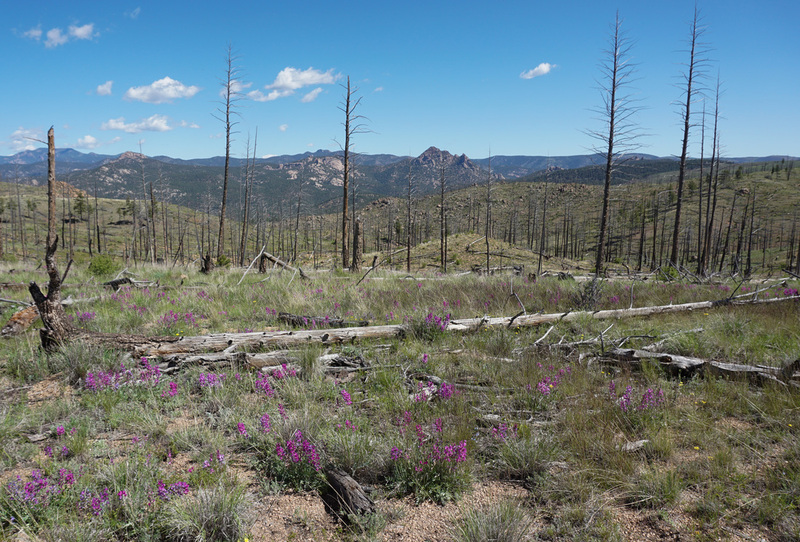 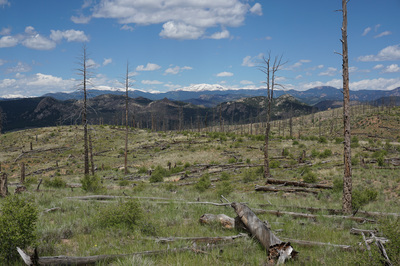 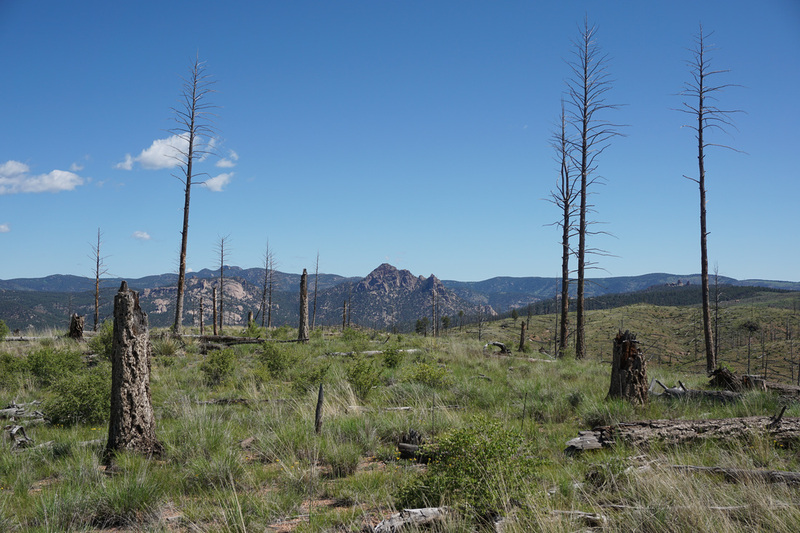 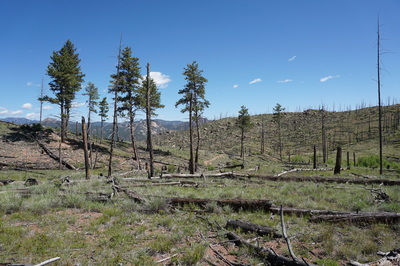 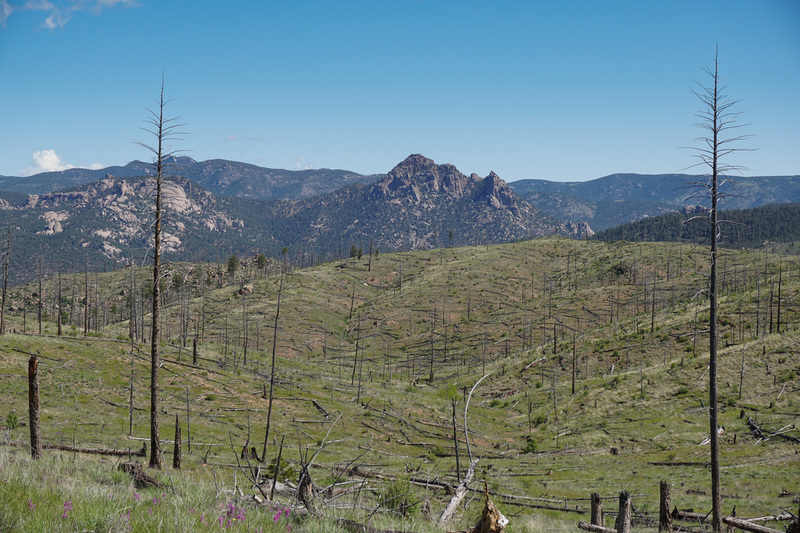 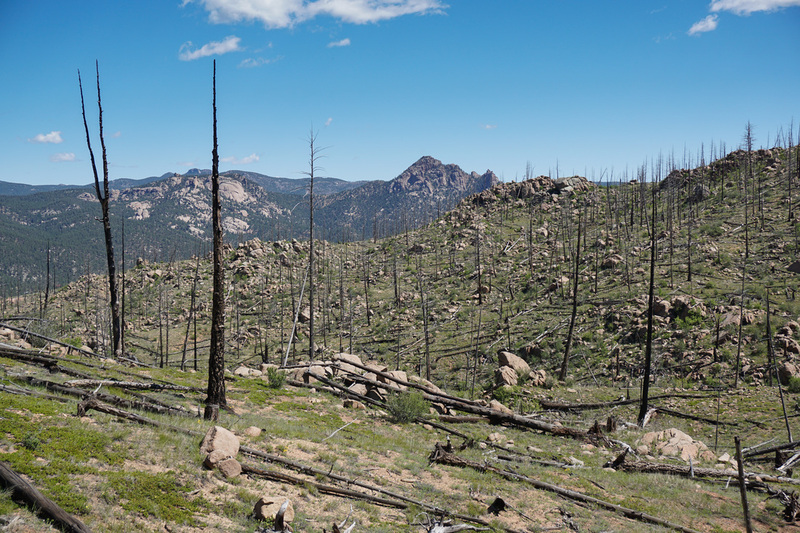 The Buffalo Burn Trail leads you through the forest out into the open burn area and the views are immediately incredible, and they don't let up for the entire hike. 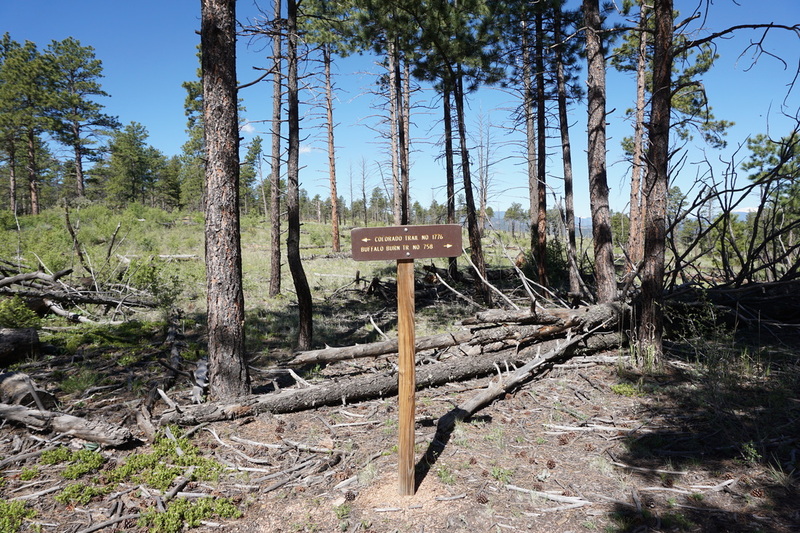 After about .5 miles you'll come to a trail junction with no trail sign. 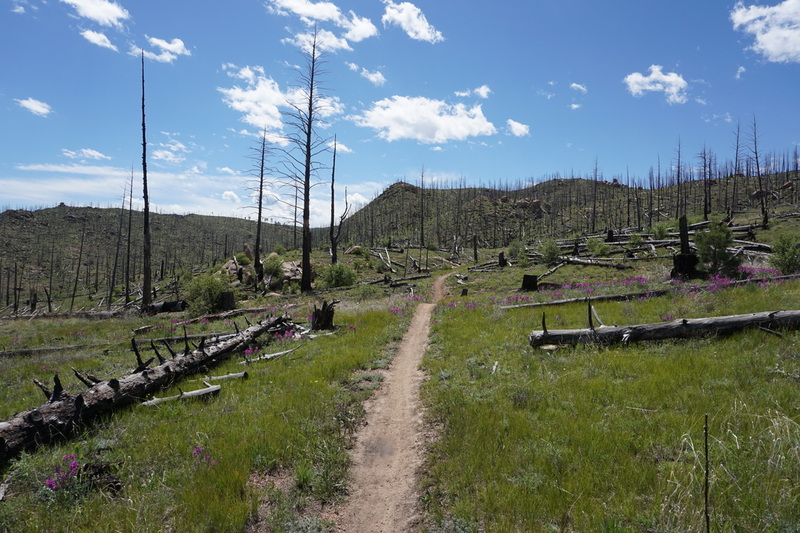 Stay straight for the Buffalo Burn Trail but turn right for the Nice Kitty Trail. 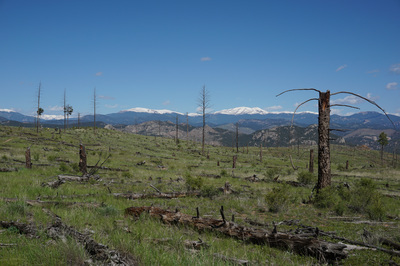 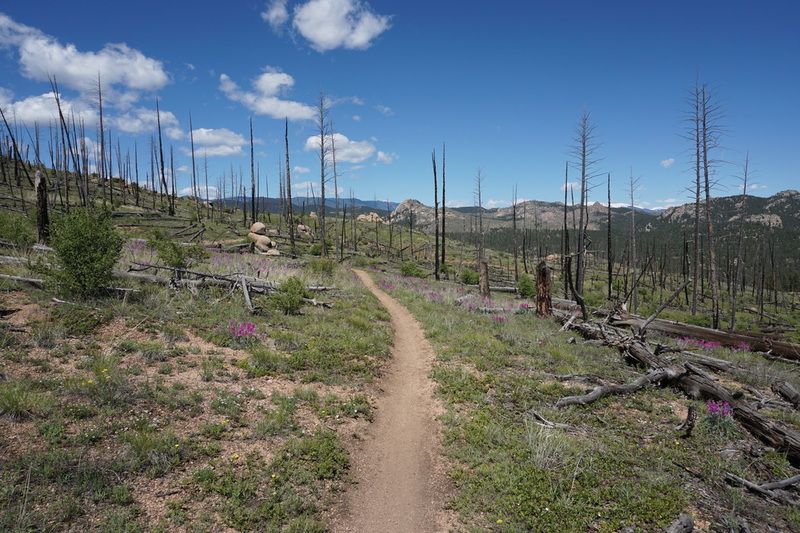 The Nice Kitty Trail heads steadily downhill through the burn area providing brilliant views of the Mt. 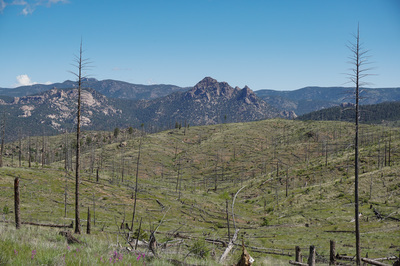 Evans Massif and the iconic rock formations of the South Platte/Buffalo Creek area, including: Raleigh Peak, Chair Rocks, the Cathedral Spires, and the Castle, among others. 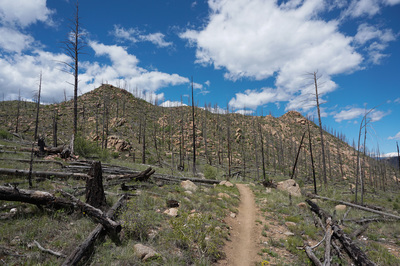 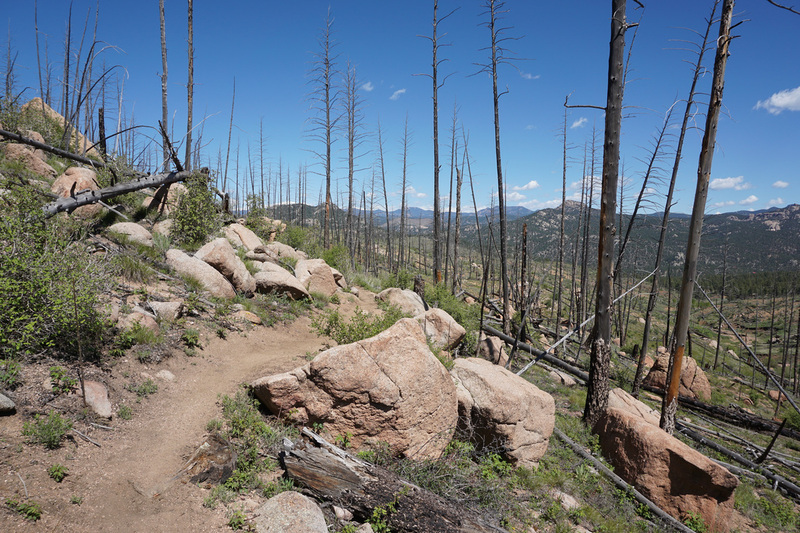 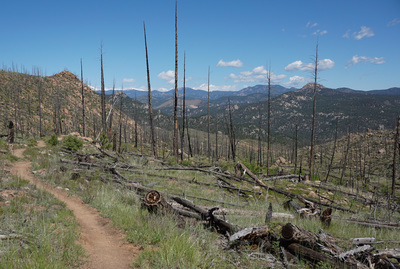 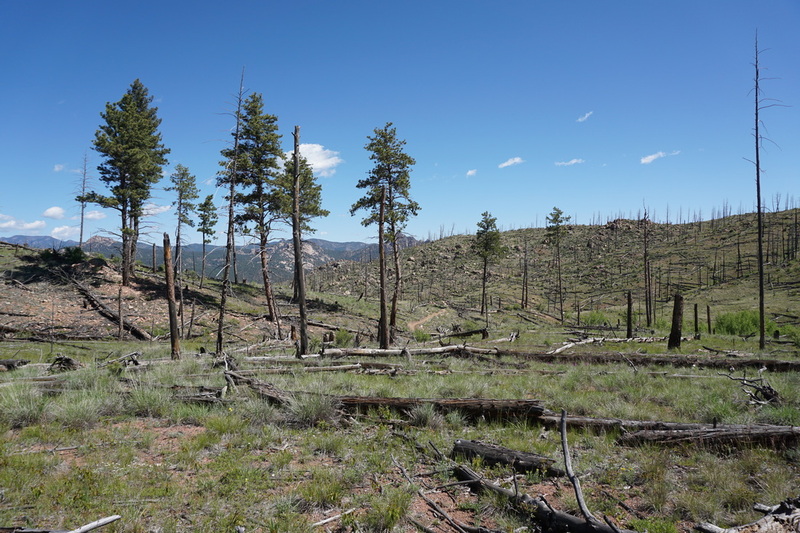 As the trail snakes down you'll enter a beautifully burnt canyon and you'll start to see the destination as the road ahead follows Buffalo Creek at the bottom of the forested valley. Descend as far as you want, if you go all the way to Buffalo Creek you'll descend about 1,100 feet in 4 miles. 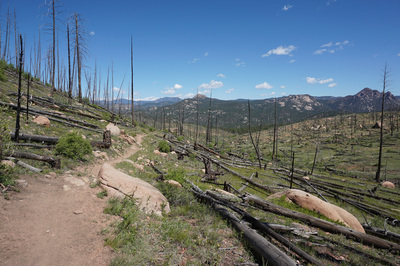 Keep in mind that you still have to climb back out on your return. However, since this is a trail built for bikes, the trail is smooth and the grade is even, therefore the hiking is not difficult even if it is long in distance. 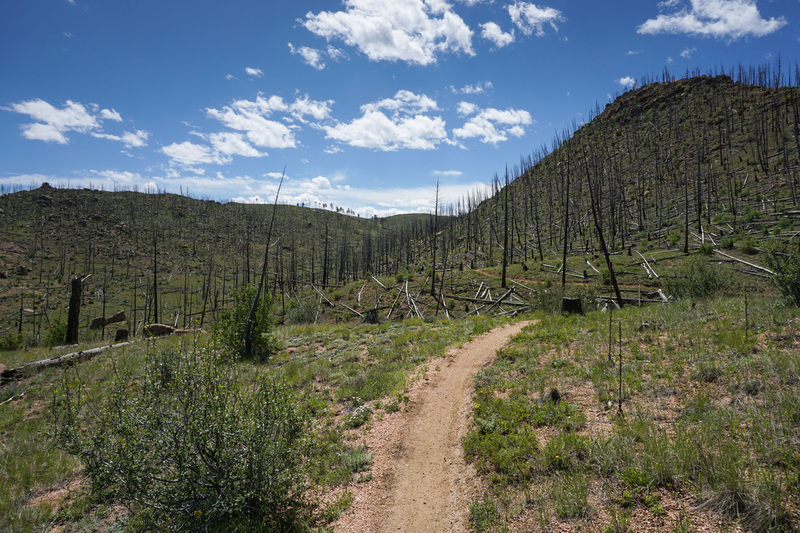 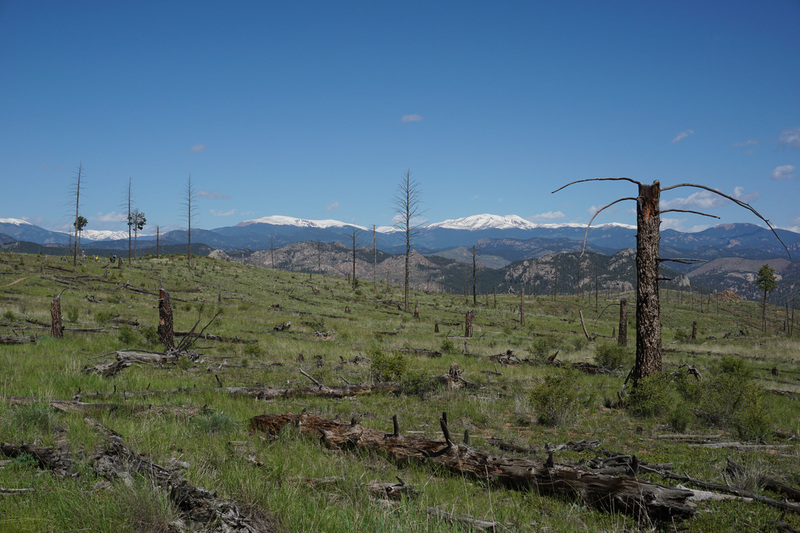 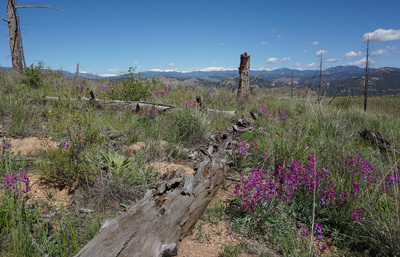 The Nice Kitty Trail is a wonderful way to explore the Buffalo Creek burn area, truly one of the Front Range's hidden gems and an amazingly beautiful landscape. 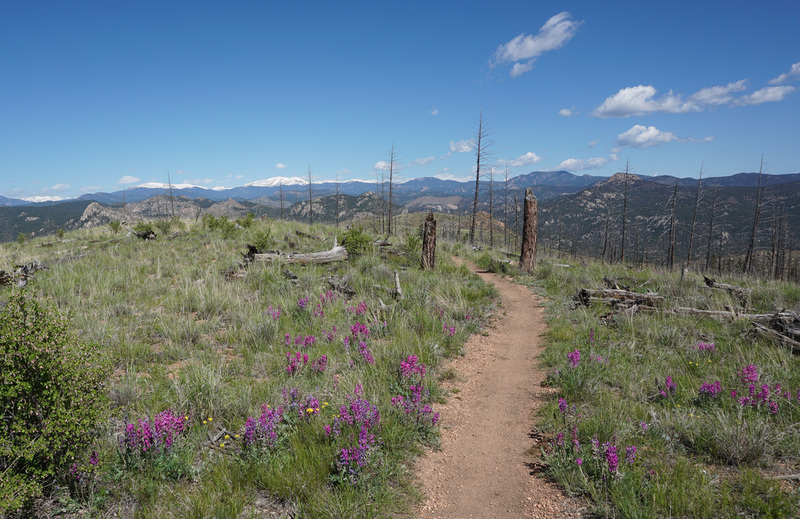 Go in the spring when the grass is green and the wildflowers are blooming. 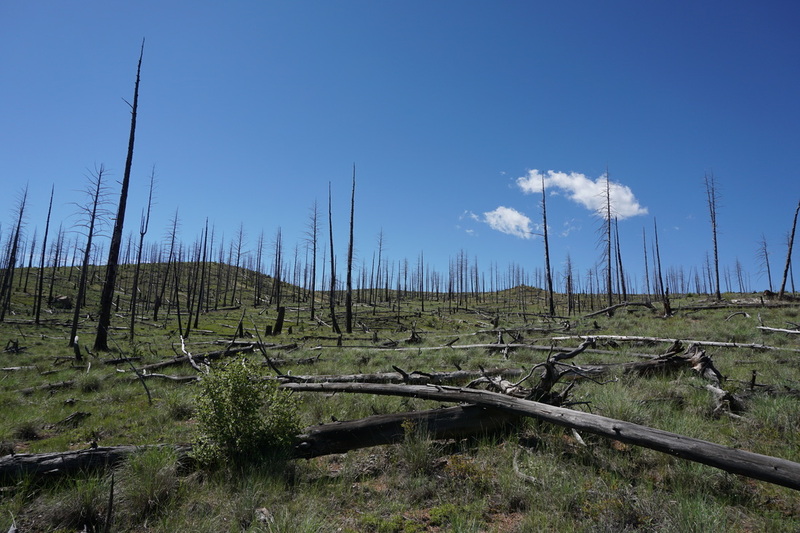 The contrast of the colorful growth against the burnt trees is unique and inspiring.